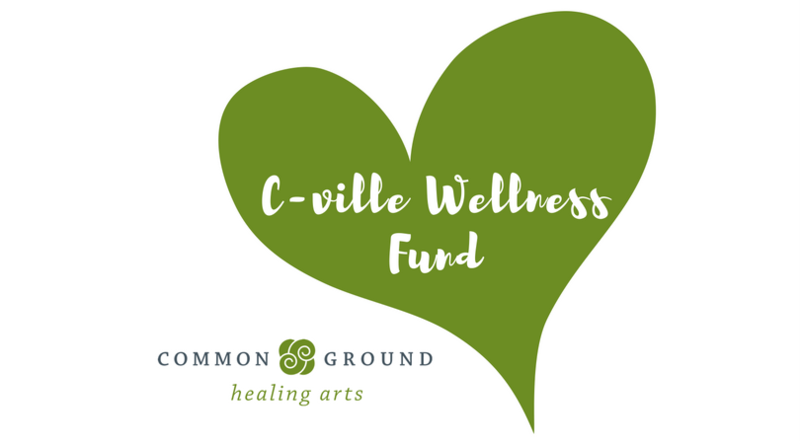 Do you know about the C-ville Wellness Fund? This fund is available at Common Ground for People of Color seeking relief from race-based trauma and/or anyone affected by A11/A12 weekend. This fund ensures our trauma-relieving services are affordable to individuals who need them as a part of their healing process. Please find answers to FAQ about the fund below and feel very welcome to call us at 434-218-7677 with any questions. The healing process for trauma can take many months and sometimes years. We encourage you to share this with anyone you know who might benefit and please bring yourself in for the care you need. – What is Common Ground Healing Arts? C-ville’s nonprofit wellness center. We offer acupuncture, massage, yoga and meditation on Pay-What-You-Can ranges. All of our services have been proven effective in relieving pain, stress, anxiety and trauma. – What is the C-ville Wellness Fund? Financial support for People of Color seeking relief from race-based trauma and/or people affected by A11/A12 needing our trauma-relieving services as part of their healing process. How to access Race-Based Trauma/A12 Relief Services? To use the fund for meditation and yoga classes, you must sign up in person or by phone, 434-218-7677.
Who is eligible for Race-Based Trauma/A12 Services? All People of Color and/or people dealing with trauma from A11/A12. Are there limitations on use of the fund such as how often or how much? C-ville Wellness Funds are available on a first come, first served basis. Massage/Bodywork is limited to one session per month. All other services are currently unlimited. We encourage everyone to come as often as needed for their healing process within these guidelines. A11/A12 Relief Services are offered Pay-What-You-Can. Should you need to cancel or reschedule an appointment please contact us as soon as possible, and no later than 24 hours prior to your scheduled appointment. After two no shows/late cancellations, you may be disqualified from using the C-ville Wellness Fund. Stay tuned to our facebook and newsletter for group healing opportunities at Common Ground or out in the community. These events offer a variety of trauma relief modalities that we do not offer in-house. – What if I don’t want to schedule in advance? Stay tuned to our facebook page and newsletter for drop-in group healing opportunities at Common Ground or out in the community. These events offer a variety of trauma relief modalities that we do not offer in-house. – How can I make a donation to the C-ville Wellness Fund? Have more questions? Please call Common Ground at 434-218-7677. This fund is made possible through The Heal Charlottesville Fund and the Concert for Charlottesville Fund in the Charlottesville Area Community Foundation.